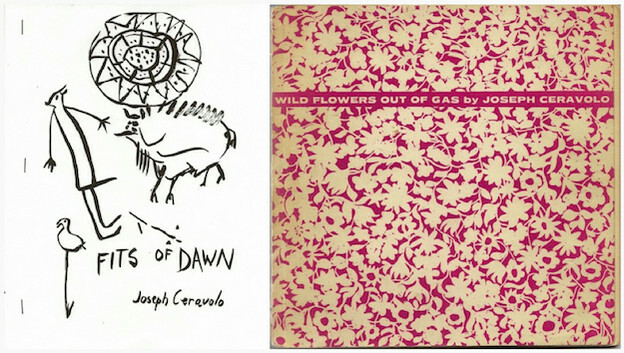 'Fits of Dawn' (1965) and 'Wild Flowers Out of Gas' (1967) by Joseph Ceravolo. I wrote this little appreciation in 1976 for the Poetry Project magazine The World. I’m pretty sure it was the second piece of prose about poetry I had ever done. This was a special issue (#30) of The World devoted to reviews, interviews, etc. For all the poetry written and published around The Project from the late ’60s through the mid-'70s, there was little interest in criticism or poetics, both of which smacked of the Establishment. I know that I absolutely loved the poems of Joe’s that I had seen, the three early collections plus a few in magazines like Locus Solus, Art and Literature, and Big Sky, and I remember wanting to do a lot of quoting. To me, Joe had a miraculous decade when he was one of the most original poets writing; Fits of Dawn (C Editions, 1965), Wild Flowers Out of Gas (Tibor de Nagy, 1967), and Spring in This World of Poor Mutts (Columbia U. Press, 1968) still belong with the best poetry of the past fifty years. I didn’t get to know Joe till the 1970s, but it’s clear that in the ’60s poems burst out of him, torn up and beautiful in Fits of Dawn, a little more connected (though by no means coherent) and beautiful in the others. I happened upon the Tibor de Nagy chapbook first and it bowled me over. When a couple of years later someone xeroxed Fits of Dawn for me, its explosions of language, feeling, meaning, and non-meaning (I’ve always suspected that a fair amount of the book was generated by fake translation), bowled me over anew. When six of us got together twenty years ago to put together a Selected Ceravolo for Coffee House (Larry Fagin, Kenneth Koch, Ron Padgett, David Shapiro, Paul Violi and I), I remember how exciting and inspiring it was — not just batting things back and forth but reading the poems and hearing them read aloud. Unsurprisingly to me, we wound up choosing almost all poems from the ’60s. Clearly Joe did extraordinary work after that too, and some of his later poems — though I would argue, more often parts of poems — are up there with the early ones, more of which saw the light of day with the publication of Transmigration Solo (Toothpaste, 1979). I remember going through a whole bunch of Joe’s very short poems that same year with Paul and choosing things for INRI (Swollen Magpie) beginning with “O moon / How ghost you are,” which is as magical as anything Joe ever wrote.